Wind Energy Wind power plants from 600 kW up to 3 MW. To prevent the foundation from tilting, normally circular foundations are being used. Different foundation types can be chosen as, depending on the site, the ground can only absorb a certain amount of load. This way, appropriate solutions can be provided at short notice for a multitude of construction projects. If required, further measures such as soil improvement or pile systems can be combined with the standard solutions. The load-dynamic design of the materials and structure used in towers provides the best conditions for transport, installation and use. Over and above the binding national and international norms (e. g. DIN and Eurocode) our solution will surpass quality and safety norms. Virtual 3D models of the tower designs are produced during the development phase using the finite element method (FEM). All possible stress factors on the wind turbine are then simulated on the model. This means that accurate predictions concerning tower stability and service life are not left to chance before building a prototype. We continuously evaluate additional measurements on existing turbines providing further verification of the calculated data. Our calculations are confirmed by results produced by specially commissioned certification bodies, research institutes and engineering firms. The aesthetic aspect is also a decisive factor during tower development, which is obvious in the finished product. The streamlined gradually tapered design offers a visibly sophisticated concept which has next to nothing in common with the huge and bulky conventional cylindrical structures. When it comes to yield, noise emission and stress minimisation, our rotor blade concept sets new standards in the wind energy sector. Because of their modified shape, the blades not only draw energy from the outer edges but also use the inner radius of the swept area, considerably increasing power output. The new rotor blades are also less susceptible to turbulence and provide an even flow along the entire length of the blade profile. In addition to the new design, the blade tips have also been improved to reduce noise emission and increase power output. Turbulence at the blade tips due to overpressure and underpressure is effectively eliminated in the rotor plane. The entire length of the blade is therefore utilised without any loss of energy caused by turbulence. The blades’ high efficiency is reflected in power curves taken on all wind turbines where power coefficients (Cp) of more than 0.5 are achieved. Amongst other features, the annular generator is a key component in gearless wind generator design. Combined with the rotor hub, it provides an almost frictionless flow of energy, while a smaller number of moving components assure minimal material wear. Unlike conventional fast-running generators, our annular generator is hardly subjected to mechanical wear, making it ideal for particularly heavy loads and a long service life. Our annular generator is a low-speed synchronous generator with no direct grid coupling. Output voltage and frequency vary with the speed and are converted for output to the grid via a DC link and an inverter which allow for high speed variability. According to the service life requirements, the copper winding in the stator (the stationary part of the annular generator) known as closed, single-layer basket winding is produced in insulation class F (155 °C). It consists of individual round wires gathered in bundles and varnish insulated. The copper winding is exclusively done manually. In spite of increasing automation in other manufacturing areas, in this case preference has been given to manual labour for good reason. It ensures that all materials used are fully inspected. Furthermore, a special work process allows continuous windings to be produced. Each wire strand is continuous from start to end. 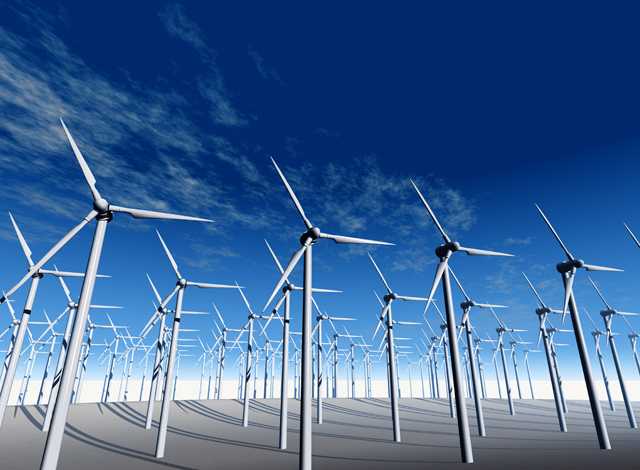 The wind turbines are equipped with state-of-the-art microelectronic control technology developed in-house. The MPU (main processing unit), the central element of the control system, constantly registers information from the peripheral control elements, such as the yaw control and active pitch control systems. Its function is to adjust the individual system parameters to ensure that the wind turbines achieve maximum output under all weather conditions. The wind turbines are equipped with a Grid Management System designed to meet the latest grid connection requirements. This facilitates integration in any transmission and distribution network. The Grid Management System offers numerous performance features e. g. reactive power management and optimum contribution to maintaining voltage levels. Essentially, the wind farms behave very much like power stations or in some aspects even exceed their performance. These product and unit certificates as well as validated simulation models will in future be used as a basis for the wind farm certificates required by the German Association of Energy and Water Industries guidelines and the latest Renewable Energy Sources Act.